Browse: Home / What a party! 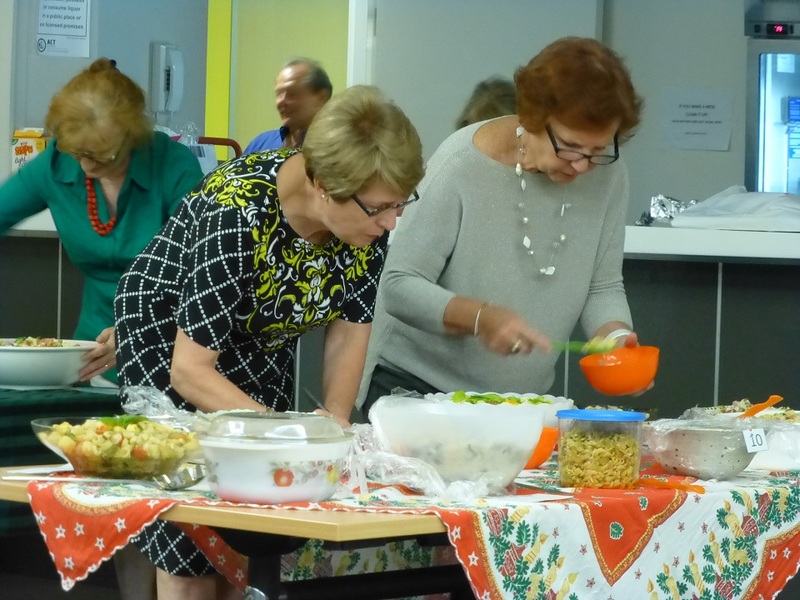 On 20 November 2014 we wrapped up the year in real style – over 100 members were in attendance including 21 people who had arrived with entries for the culinary competition which this year called for cold dishes based on pasta or rice (not necessarily Italian). While the three competition judges (Ottavio Bagozzi, Anna Capezio and Sandra Catizone) were evaluating each entry, the entertainment commenced. First up was a surprise appearance: our Treasurer Mario Rosi revealed his outstanding accordion-playing skills as he performed three beautiful pieces – playing both sides of the accordion and without the need to read music, just as accomplished musicians do. (He later explained that he’s been playing since childhood, a secret he had kept… quite secret). The Dante Musica Viva choir provided the major part of the entertainment, performing a variety of pieces including the much-loved carol Tu scendi dalle stelle and three opera arias composed by Giuseppe Verdi (Noi siamo zingarelle, Il coro degli zingari and Libiam, this latter featuring our tenor Livio Chicco and soprano Virginia Banyard). The choir’s musical director/leader Francesco Sofo conducted the choir in his typical ebullient style and told the appreciative audience that DMV had just recorded its second CD which would be available in the first quarter of 2015. He also announced that the choir would hold its third annual concert in April/May. 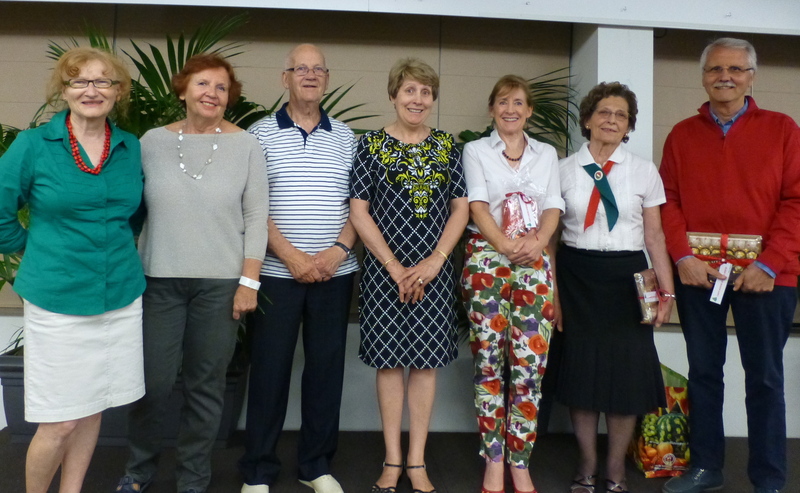 On behalf of the singers, I presented gifts of appreciation to the choir musicians (Angela – piano; Louise – mandolin; Rod – guitar; Genevieve – violin; and Wal – mandolin and also piano. (Big) Ben on the double bass was currently overseas). I then proceeded to present gifts on the Dante Committee’s behalf to three key people: Francesco Sofo who has been the choir’s instigator and musical director/conductor since its foundation – and stands in for absent musicians but also plays the piano accordion when required; Saverio Palma who manages rehearsals and performances and also conducts some of the pieces and plays the trumpet when necessary; and David Wilson who carries and sets up the sound system, is responsible for the technical aspects of cultural events and generally lends a hand when one is needed. All three people have been with the choir since its foundation ten years ago. Franco Papandrea then presented me with a gift for my long-term commitment to and multi-faceted roles in the Society (thanks Dante Committee! I’ll drink the good wine on a special occasion). 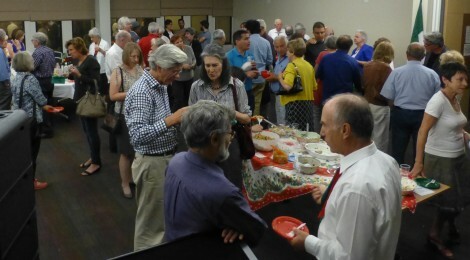 Everyone then enjoyed the convivial atmosphere and good food – the competition entries were devoured as well as the traditional pizza and panettone provided by the Society, all watered down with good wine.